Summer Song Stop tour begins in May! Paul Sanchez is headed out for a summer drive around the country to strum, to tell stories, bring smiles and a bIt of New Orleans wherever he goes. Paul is working on a new recording of songs set for a Fall release with new tunes and new tales to tell all solo acoustic. Welcome to the new and improved paulsanchez.com! More to come in the future. Check back soon. 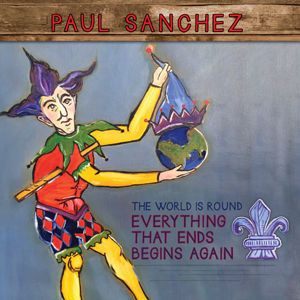 Native New Orleanian Paul Sanchez, a noted musician, songwriter, singer, producer, writer, and actor announces the release of his 12th solo album, Everything That Ends Begins Again. Paul Sanchez’s award-winning music defies categories – melding rock, country, folk, blues and jazz into an inimitable sound that expands the mind, opens the soul, and leaves listeners wanting more. Everything That Ends Begins Again marks a return to the rock, pop and folk songs for which Paul Sanchez is most known. Made possible by a grant from the Threadhead Foundation, an organization working to change the lives of New Orleans musicians since Katrina, the album was produced by Jay Weigel. John Boutte, Erica Falls, Jonathan Pretus contribute vocals. Shamarr Allen plays a trumpet solo on “It Makes Me Smile,” a song Paul co-wrote with Mark Bryan from Hootie and The Blowfish. Paul is backed by two Cowboy Mouth alums in Sonia Tetlow on guitar and mandolin and Mary Lasseigne on bass guitar. The band is rounded out by drummer Linda Bolley who plays with Sonia in the great Atlanta based band, Roxie Watson.